LEGOWORLD, Zwolle 2010 at the massive IJsselhallen opened its doors for the tenth consecutive year. Robots are already walking around. 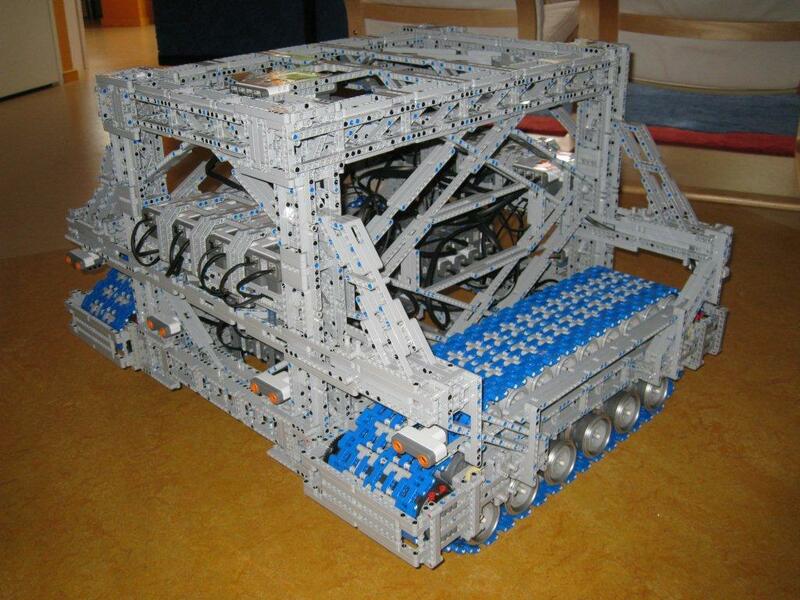 This is an autonomous Rover been built to run at this year's LEGOWORLD. It is a project from Eric Steenstra who has been involved in other very large projects with MIDSTORMS NXT with some other friends, during the past editions of LW events. If according to the original plan, the big arm on it, should have a camera that takes pictures of the crowd around. Think this monster uses 9 NXT intelligent bircks an off course some PF L-motors and other sensors. You may take a look at more detailed photos and schematics, from Eric's Brickshelf folder here. We should see more and great constructions, the next days! More detailed info about the monster vehicle, taken from this video at YT. "...holds 13 NXTs, 32 PFXL motors, a photo camera, a wireless movie camera. the top can extent to 3.4 meters, and the camera is then at 2.4 meters up. It was made to take pictures during the LEGOWORLD show in Zwolle in 2010."